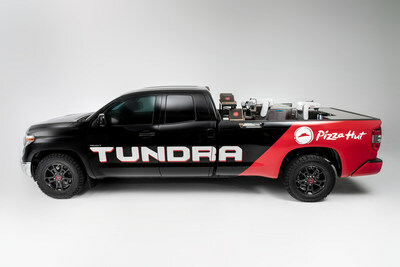 PLANO, Texas, Oct. 30, 2018 /PRNewswire/ -- Pizza Hut has joined forces with Toyota to develop the one-of-a-kind, zero-emission Tundra PIE Pro, a mobile pizza factory with the ability to deliver oven-hot pizza wherever it goes. The full-size pizza-making truck was introduced at Toyota's 2018 Specialty Equipment Market Association (SEMA) Show presentation. 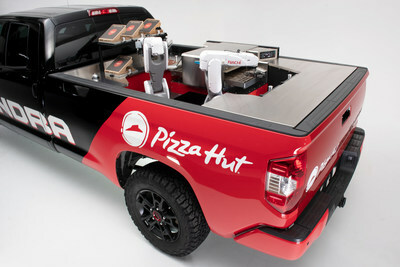 Pizza Hut and Toyota team up at SEMA 2018 to unveil the Tundra PIE Pro, a one-of-a-kind, zero-emission mobile pizza factory. Earlier this year, Toyota announced the E-Pallete Alliance, which includes Pizza Hut, and unveiled a fully-autonomous concept vehicle at the Consumer Electronics Show (CES). The Tundra PIE Pro is the second collaboration from the two innovation-driven brands. For more details visit Blog.PizzaHut.com or head to PizzaHut.com to order now.